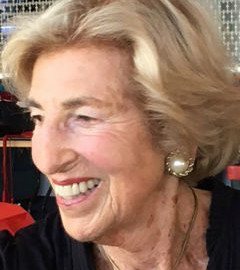 A Kindertransport child from Austria, Hella Pick became a pioneer among women journalists whose first job as a young, now British, journalist took her to West Africa in the late 1950’s to cover the independence negotiations of the region’s British and French colonies. Spending the next 35 years with the Guardian, Hella covered the world stage ranging from the Kennedy assassination and the Selma March in US to the Cold War in Europe and the collapse of the Berlin Wall. Willy Brandt was among the many friends she made among world leaders. Her international network widened and took her on to China when she moved on to work at George Weidenfeld’s Institute of Strategic Dialogue. At the invitation of the BBC, Hella selected her favourite music Discs and has been enjoying her stay on a secret Desert Island – a perfect location for writing a memoir of her life. Before going on this adventure she also found time to write two highly acclaimed books: Simon Wiesenthal: A life in search of Justice and Guilty Victim: Austria from the Holocaust to Haider. She has a CBE and has also been awarded high distinctions by the Austrian and German governments and though she does not want anyone to address her as ‘doctor’ she was greatly cheered to be awarded an honorary doctorate by Sussex University winning title. Alan Samson at Weidenfeld & Nicolson has bought UK and Commonwealth rights in Invisible Walls, Hella’s autobiography.